The New England Deluxe is our most substantial arbor. It has 4X4 posts and arches and diagonal lattice side panels. There are 1-1/2" dowels running between the arches. With its 48" opening it will make a statement in your garden or landscape design. 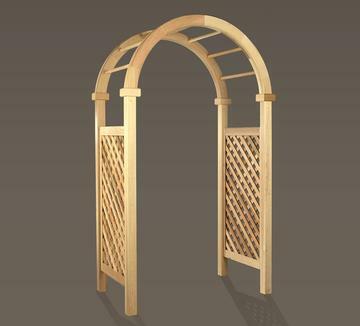 Use it in conjunction with a fence or hedgerow to create a gateway between your outdoor spaces.